Talent is everywhere, but opportunity is not. Higher Achievement seeks to build a world where every child's promise and potential is realized, regardless of circumstances. 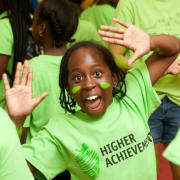 Higher Achievement closes the opportunity gap during the pivotal middle school years. By leveraging the power of communities, Higher Achievement's proven model provides a rigorous year-round learning environment, caring role models, and a culture of high expectations, resulting in college-bound scholars with the character, confidence, and skills to succeed. Higher Achievement is an intensive after school and summer program that helps middle school students reach their full potential in high school, college, and beyond. Mentors teach up to three scholars in an area of their choice including Public Speaking, STEM, Technology, English Language Arts, Math, or Character Development, with a strong emphasis on relationship building. As a mentor, you choose the subject you would like to work with, and we provide you with curriculum, training, and on-site support. The commitment to being a mentor is one hour one night a week throughout the school year, October-May. Mentors work with scholars from 5:45-7pm, Tuesday and Thursday. Mentoring will be held at Pittsburgh Langley K-8 as well as Sterrett Classical Academy. This is a perfect opportunity persons of any age, career or college major to make a difference and gain experience. However, it especially provides invaluable experience for those interested in education, child development, medicine, and the social sciences. To apply, visit higherachievement.org/volunteer/ and sign in as a new applicant. Follow the instructions to submit your application.